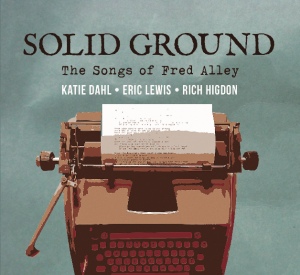 On this album, Katie Dahl, Eric Lewis, and Rich Higdon give voice to the songs of Fred Alley, an actor, playwright, and Door County, Wisconsin luminary who died suddenly in 2001 at age 38. Hundreds of thousands of people have seen Alley’s theater pieces (most notably, “Guys on Ice” and “The Spitfire Grill”), but his non-theatrical songs are less well-known. Laced with dobro, mandolin, harmonica, guitar, upright bass, and washboard, the twelve songs on “Solid Ground” are thoroughly steeped in imagery of northeastern Wisconsin (flannel sheets, threshers on the highway, Lake Michigan) but are also worldly and sophisticated, literary and spiritual.